A ‘refracted’ trail of Wasmannia auropunctata workers at the medium border between smooth (white) and rough (green) felt. The position of the food is on the rough felt. The density of workers on the rough felt is higher than on the smooth felt because travel speed is lower. In addition, it appears, although not very obvious, as if the ants on the rough felt ‘float’ on top of the felt hairs, indicating the difficulty of walking on this substrate. Credit: Simon Tragust. (Phys.org) —Ants have long been known to choose the shortest of several routes to a food source, but what happens when the shortest route is not the fastest? This situation can occur, for example, when ants are forced to travel on two different surfaces, where they can walk faster on one surface than on the other. In a new study, scientists have found that ants behave the same way as light does when traveling through different media: both paths obey Fermat's principle of least time, taking the fastest route rather than the most direct one. Besides revealing insight into ant communities, the findings could offer inspiration to researchers working on solving complex problems in robotics, logistics, and information technology. The researchers, Jan Oettler, et al., from institutions in Germany, France, and China, have published their paper on using Fermat's principle of least time to predict ant trails in a recent issue of PLOS ONE. The scientists experimentally studied the behavior of the little fire ant, Wasmannia auropunctata, one of the world's 100 most invasive species. They collected three colonies, each containing several thousand workers and multiple queens, from different sites in Israel. They put the ants in plastic boxes without food, and then connected each box to its own foraging arena where cockroaches were provided as food in the corner opposite from the entrance. The surface of each foraging arena was split in half, and each half was covered by a different material. The researchers experimented with combinations of three materials that differentially affected the ants' average walking speed: rough polyester felt (1.73 mm/s), smooth polyester felt (2.97 mm/s), and polyethylene glass (4.89 mm/s). When ants forage, they deposit pheromones to build a trail, and favorable trails become reinforced with increased usage. 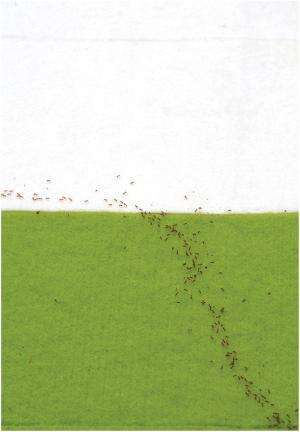 Given the ants' average walking speeds on different materials, along with information on the distances across the foraging arena and the angle defining the shortest path (the straight line) between the entrance and the food, the researchers predicted the angle at which the ants would cross from one surface to the other if they chose the fastest path. In accordance with Fermat's principle of least time, this angle can be thought of as the angle of refraction, similar to how light refracts at a certain angle at the boundary of two media in which it travels at different speeds. The researchers calculated the fastest path as predicted by Fermat’s principle of least time (dotted yellow line), which is not the direct path. 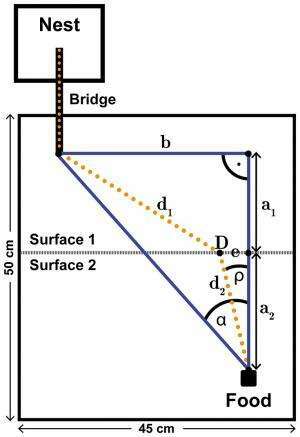 In this example, the ants can walk faster on Surface 1 than on Surface 2. Credit: Jan Oettler, et al. The researchers found that the ants' paths closely matched those predicted by Fermat's principle of least time and did not follow the most direct route. In other words, the ants accounted for the different walking speeds on the different surfaces and traveled a longer distance on the surface where they could walk faster. "We found that a general rule applies to a dynamic system that relies solely on communication (pheromones) and social cooperation," Oettler told Phys.org. "This system depends on two features. One is routing information that decays over time and needs to be refreshed, thus making the system flexible. And second on behavioral flexibility by the worker ants that carry this information. A path can only be adjusted by worker ants that do not follow this path, but rather take alternative routes (that they advertise), which may be faster (or slower) than the already established path." Oettler added that the speed with which information decays is crucial to this system, so the results here may be adapted to information routing problems. The researchers noted that Wasmannia worker ants also resemble humans in this way, since humans have also been found to follow Fermat's principle when forced to cross surfaces with different qualities. One clear example is when a lifeguard has to find the fastest way to traverse both beach and water in order to reach a drowning swimmer. The researchers also noted that several other factors likely influence why ants choose the paths they do. For instance, the results here suggest that ants prefer to move along edges of borders (in real life, for example, ants are often seen walking along the edges of a sidewalk). Landmarks facilitate orientation, and for ants this could mean that lower amounts of pheromone are needed to mark trails when combined with the physical cues. This is one area that the researchers hope to study more in the future. "We have only shown the outcome of this process," Oettler said. "In the future we want to study the dynamics of the trail pheromones, their active compounds and evaporation rates. We want to perform behavioral tests with synthetic compounds and detect perception thresholds of individual ants. We also want to study the early dynamics of trail formation over time." Why least time and not least action? Least action = shortest path = can take longer to get to the food source. Ants obviously enjoy eating sooner rather than later... saving day light > saving energy? Why? Who knows, study their evolution, maybe it'll become clear then why the preference exists. Reference the phrase 'burning daylight'. Apparently even to humans being time-efficient is a high priority. I find myself gladly burning extra energy to save time... don't you? But why... why indeed. Impatience? Etc. These ants are really saving their energy exerted for walk, not just time. They're able to solve mazes and traveling salesman problem in this way. We can just ask, whether they're doing it, because they're too primitive, or because they're sufficiently intelligent. Is photon intelligent, when it spreads along geodesics? BTW The ants should exhibit some total reflection phenomena, when approaching the phase boundary under low angle. saving day light > saving energy? Why? You're not counting the energy your body uses just to stay alive, whether or not you're "doing" anything. Those things use a lot of energy all the time, therefore finding food faster uses less total energy, even if more energy is spent on work than the slower alternative. Do ants exhibit the particle-wave behavior? And ya accuse me of not being serious enough here? With your electron-ducks, elephant-neutrinos, and the particle-wave ants? Zeph, ya must be honest enough to admit, "electron-ducks on water waves", "neutrino-elephants siphoning water", and now "ants exhibiting wave-particle duality" are just a tad on the "non-scientific" side, more befitting a cartoon? Do ants exhibit the particle-wave behavior? And ya accuse me of not being serious enough here? Not at all, this is serious physically testable question. If the ants would exhibit the wave behavior, then their crowd should exhibit some reflection phenomena at the phase boundary, i.e. not just refraction. But they don't exhibit reflection - so it's apparent, they're moving like the pure fermions (i.e. their de-Broglie wavelength is negligible). Psst, Zeph, there are many stupid questions. It's only that some people are so stupid that they don't realize their questions are stupid. Stupid people who think they are smart,, think that they ask smart questions,, which are in fact stupid questions. That's how ya know when a question is stupid,,, if the person asking the question thinks they are very smart,, when actually they are very stupid,,, so stupid that they think their stupid questions are smart questions. I'm just posting this question here because this site doesn't have a directly associated "general purpose forum". Why is it that almost no discovery ever reported on this site gives rise to a marketable product? Hopefully carbon nanotubes will eventully, but gee, it's sickening to see article after article about some bio-medical fact, or some chemical or technology discovery, which goes years and years without ANY product coming from it. Just for example, there's a new MRSA cure every month or two, and NONE of them ever goes to market. Further, they already know they can cut ALL bacterial infections, including MRSA, just by copper plating the most contacted surfaces in hospitals, but even that ridiculously simple, low tech solution is not implemented. Why?! Because the scientists are payed by citation index, i.e. the way, in which they do provide the occupation opportunity for another scientists - not by the actual progress and usefulness of their findings for the rest of human civilization. Because it takes a while to go from 'freshly discovered' to 'marketable product'. Generally on the order of a decade. Give it time. Especially if we're talking about pharmaceuticals then the time fom first test to market is pretty long. You have to go through a number of phases - and each phase can last from months to several years. The investments into a new drug are enormous (a drug that goes through all phases may have cost about 100 million dollars in the process). And the stuff that works in laboratory tests (culture or animal) mostly doesn't work in real life, because of side effects and/or differing physiology. About 1 in 100 drugs go from phase I to phase IV. but even that ridiculously simple, low tech solution is not implemented. Why?! There's no money in it. Health systems are profit oriented - not patient oriented. Because this is a science site and not a business site? Besides that, sometimes it's not obvious how observations are translated into technological gains. The concept of it being easier to have many simple autonomous parts performing simple tasks to achieve a set goal (and have the ability to adapt to a variety of changing situations), rather than one huge complex machine trying to perform complex tasks to achieve the same goal comes directly from observations like this. What you seem to be advocating is a sort of top-down control via business - well that's an analog of the latter system rather than the former. It'll reduce variation in ideas and the ability to cope with changing situations. Interesting point on copper though. Electron-ducks, neutrino-elephants and now wave-particle-ants. I think Zeph is building his own version of a particle zoo. Mmmm, I wonder what other animals he is planning on populating it with. Somehow, I don't think that we will need to wait too long to find out....maybe flying proton-pigs? (That might just cover aerodynamics) Yup, definitely something for the cartoon section of my morning paper. Zephyr, that is a blatant, intentional, and completely groundless LIE. That is the most untruthful and most unrealistic post ya have ever made. And that was quite the feat,,, writing one that I could single out with such certainty. It's always simpler to invent a parody of concept, than to understand and apply this concept itself. Every thought any man has ever thunk is simpler than any of your analogies. That's why they never work. They are too convoluted and inconsistent to even come close to modelling reality. Could you provide some more realistic alternative for my stance? Because I content that the best scientists are the ones engaged in pure research and in academia. They are not getting wealthy there. If it were "the big bucks" they were after, then they would be engineers, inventors and technologists. That's where ya find the big incomes. I call "Big Fat Lie" on that one. The only thing that your impact rating is good for is to apply for professorship. Most universities require a minimum cumulative impact rating for an application to be considered. But whether you exceed that minimum by little or a lot doesn't make any difference - since it's all about whether your research meshes well with the other departments (you get the job depending on the research plan you propose to the board - not your references). Science nowadays is about collaboration. After you get tenure it doesn't matter one bit whether you publish daily, once a year or never again. It doesn't matter whether you manage to write grant applications for a billion or zero dollars per year. Your pay is the same in any case. Science nowadays is about collaboration. Such a politically correct phrases don't address the substance at all. I know perfectly, what the contemporary science is about - and I'm not very happy about it. Just try to answer, what makes the successful scientist today? And when I say "scientists are payed", then I'm not talking just about salary, I'm talking about access to grants and another incentives. The origin of the problem is, the basic research is very separated from practical reality, yet it requires to have it's criterion of performance and success. And because it cannot apply the utilitarian criterion outside of scientific community, it seeks for them inside of it. The result is, the criterion of success and performance are scientific community based, not based on the rest society, which is paying it all. This apparently brings the problem, because we don't pay the research for research - we are paying it for progress of human society as a whole. Beautiful 1 April serious paper !! I will test and reproduce on the small ordinary ants (not fire ants ) coming in my kitchen, for any lost small food , through any small remaining invisible hole !!! Ants are clever than Fermat, since 70 millions years !! Like in the quantum mechanic, they explore all the paths, but without the waves behind the quantum particules, !! May be our microscopic world at the Plank scale is full of ants, exploring all the paths, with interfering waves !! !